Most people don’t know how important magnesium is for our health. Magnesium is involved with over 300 metabolic processes in the body. As a result, magnesium has been referred to as the “master mineral”. 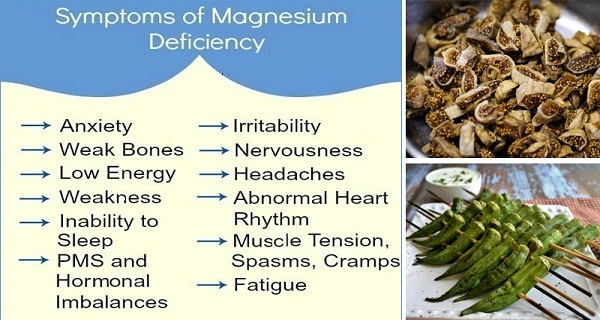 But, do you know how to spotmagnesium deficiency, and what the symptoms are? If the answer is no, then this article is just the thing you need. Why is magnesium so important? Well, for starters, it’s a mineral used by every organ in your body, especially your heart, muscles, and kidneys. If you’re suffering from unexplained fatigue or weakness, abnormal heart rhythms or even muscle spasms and eye twitches, low levels of magnesium could be the culprit. Modern farming methods that use chemical fertilizers, pesticides, and insecticides, are to blame for heavily depleting the topsoil from its mineral content. As a result, magnesium is now missing from most of our topsoil. According to some estimates, around 80% of Americans are not getting enough magnesium and may be deficient. Researches have shown that only about 25% of US adults are getting the recommended daily amount of 310 to 320 milligrams (mg) for women and 400 to 420 for men. More concerning is the fact that this amount of magnesium is only enough to ward off deficiency. Organic foods may have more magnesium if grown in nutrient-rich soils but it is very difficult to make that determination. If you’re opting for a supplement, you must be aware that there are a wide variety of magnesium supplements on the market, because magnesium must be bound to another substance, is there’s no such thing as a 100% magnesium supplement.The substance used can affect the absorption and bioavailability of the magnesium, and may provide more targeted health benefits. Magnesium threonate and citrate are some of the best sources, as it seems to penetrate cell membranes which results in higher energy levels. Apart from taking supplements, there’s another way to improve your magnesium status – regularly taking Epsom salt baths or foot baths. Epsom salt is a magnesium sulfate that can be absorbed through your skin. You could also use magnesium oil for either topical application or absorption.However, when using supplements, be sure to avoid any containing magnesium stearate. Magnesium stearate is a common, but potentially hazardous additive. It’s almost impossible to overdose magnesium. However, consuming too much magnesium is still not a good idea. Too much magnesium can lead to side effects, such as irregular heartbeat or slowed breathing.Similar to oral ascorbic acid C, there is a bowel tolerance threshold that brings on diarrhea if exceeded. One way you could tell if you’re getting enough magnesium is the “bowel test”. As we mentioned above, having too much magnesium leads to your stools becoming loose. This, however, may be a blessing for people with constipation which is one of the many ways magnesium deficiency manifests. Magnesium has anti-inflammatory properties. As a result, it can protect from illnesses such as arthritis and Alzheimer’s disease. Magnesium has also been used to aid problems like high blood pressure, diabetes, respiratory issues, and much more. Observing bodily signs can help you tell if you have a deficiency. Though, it’s still best to have some tests administered.If you’ve recently had a blood test, you might assume it would show a magnesium deficiency. However, only 1% of magnesium in your body is distributed in your blood. So, a simple sample of magnesium from a serum magnesium blood test not very helpful. Inexpensive products containing magnesium citrate (which is among the most readily absorbed forms of magnesium supplements) are a good way to get more magnesium. Apply transdermal magnesium chloride topically is also a good way. This way, the magnesium chloride will be absorbed through the skin. Magnesium chloride is also known as magnesium oil. Though it’s not really an oil, but more of a briny solution from ancient sea beds. You can find it through various online sources. So all you need to do is Google magnesium oil products.